Hai readers .. Today I am posting an old post from my old blog Jesni's kitchen. This recipe is done by my mom. Thanks a lot to my mom... 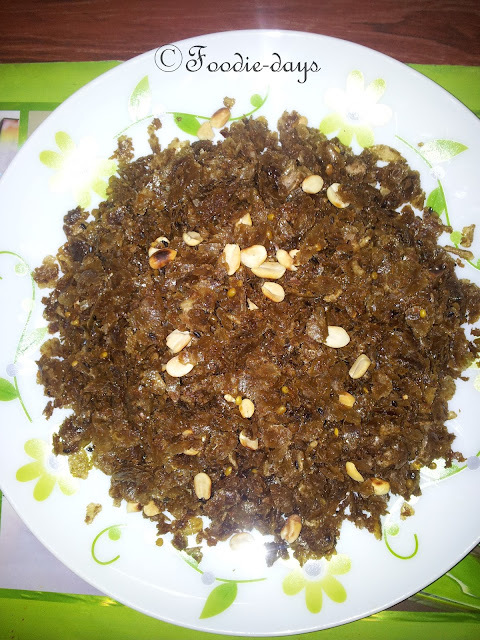 I am sure you will love this taste and you should try this..
Aval (brown or white rice flakes): 1/2 kg. Water: 1/2 to 1 cup. Roasted Jeera powder: 1/2 tsp. Coconut: 1 whole coconut scraped. Heat water and add jaggery (if jaggery is not clean you have to strain it once it is melted). After jaggery is melted allow it to simmer for sometime till get a one string consistency (thread like). Then add the fresh coconut .. Mix well and allow it to simmer for another 3 or 4 minutes so that the moisture in the fresh coconut will be absorbed. Add the roasted rice flakes into this. Mix well. Lastly temper ghee add cardamoms and drizzle on the aval. Sprinkle jeera powder and add cashews ,raisins ,pea nuts and again mix well. When it is completely cooled,Serve with tea.. It is delicious.